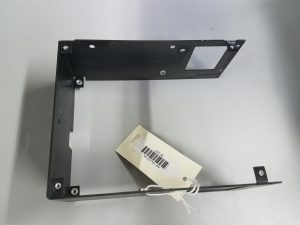 Back in September 2018, we got a new addition to the LCM+L computer collection, but we didn’t talk about it. This was something that we had been looking for for 10 years or more. We knew where a couple of these machines were, but were not able to convince the owner of that collection to part with one. We kept looking, but the ones this collector had were the only ones we could find. Well, that isn’t quite true, Stephen Jones and I went down to the San Francisco Bay area to visit the Computer History Museum, and photograph one they had in their warehouse, but they weren’t willing to part with it. We thought maybe we could build one. Stephen went to Australia on a hunt, and came back with some bits of one of these, but not a whole machine. Stephen finally got the owner of the big collection in Sweden on the phone, and got him, Peter Lothberg, to talk to us again about his collection in late spring last year. A bunch more negotiations happened. Paul Allen was brought in, and a contract was signed. A couple of our Archivists, Cynde Moya and Ameila Roberts, along with Stephen Jones and Jeff Kaylin, from Engineering, went to Stockholm in August to go over the whole collection, and pack up everything Peter was willing to sell us, put it in containers, and get them on a ship. 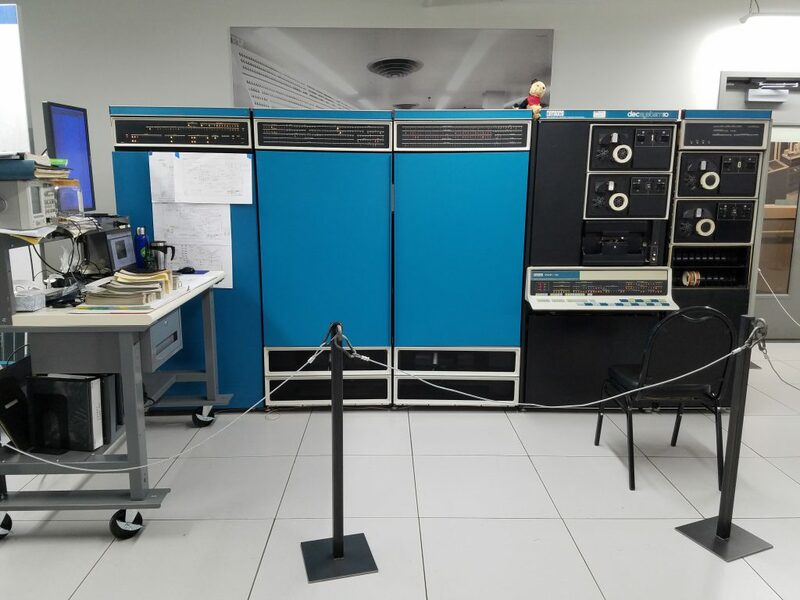 KATIA: a PDP10-KA, Serial Number 175. The first thing we had to do to KATIA to get it running was to upgrade the power supplies. 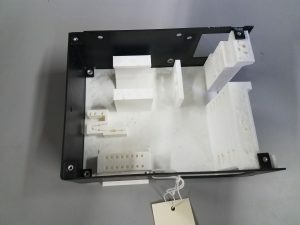 For a lot of our older mainframes, we have decided to leave the old supplies in place, and just move the wiring over to new efficient and reliable switching power supplies. David Cameron and I spent around a week figuring out how to do this, this time around, and I think it looks pretty good! KATIA Bay 1 power supplies (sideways). The silver bits, are the new supplies and their mounting plates, mounted either in front of, or next to the original power supply filter capacitors. 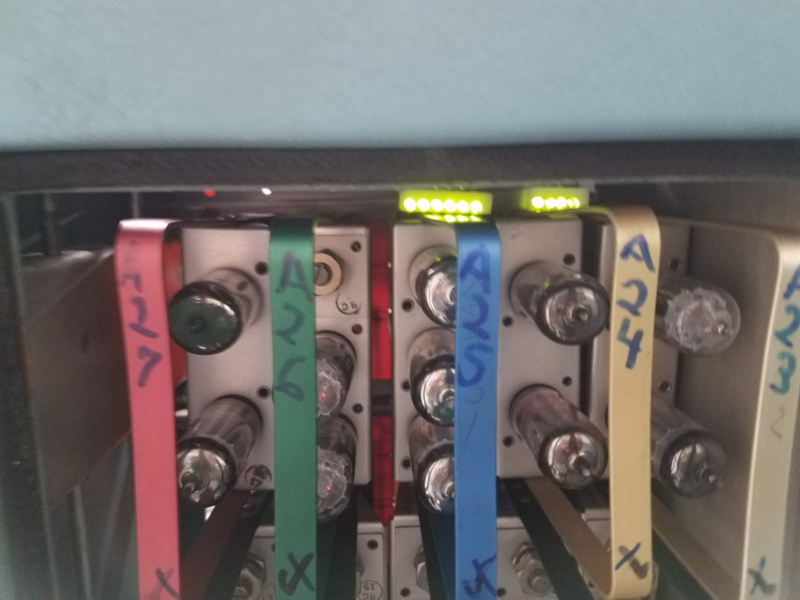 We also had to upgrade the power supplies in the memory, where we have designed new modules to replace the old modules, but the parts were scarce, so we just replaced all the old aluminum electrolytic capacitors in the existing modules. We re-configured the main blowers to run on lazy American electrons (120V), as opposed to those very energetic (240V) European electrons that they were set up for. We powered up the machine, and I started into the debug process. I started by adjusting all those new power supplies so that all the correct voltages appeared at the correct places, and they all shared the load as best I could. Now, what can it do? One of the first thing we will need is to be able to read diagnostics on the paper tape reader. With the KI, I had discovered this process requires the adder part of the CPU to work, and so I fired up the Way-Back machine to recover how I had tested the KI back then. It only took two instructions, and ADDI (add immediate) and a JRST (jump). But wait, they have to be stored somewhere! I had to fix some memory. 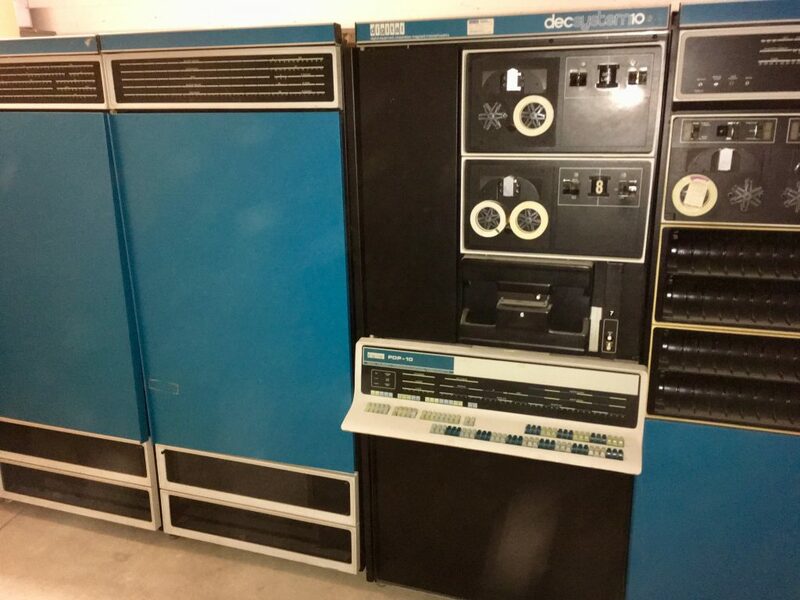 In PDP10’s there are two kinds of memory, Accumulators (the first 16 locations of memory), and main memory. 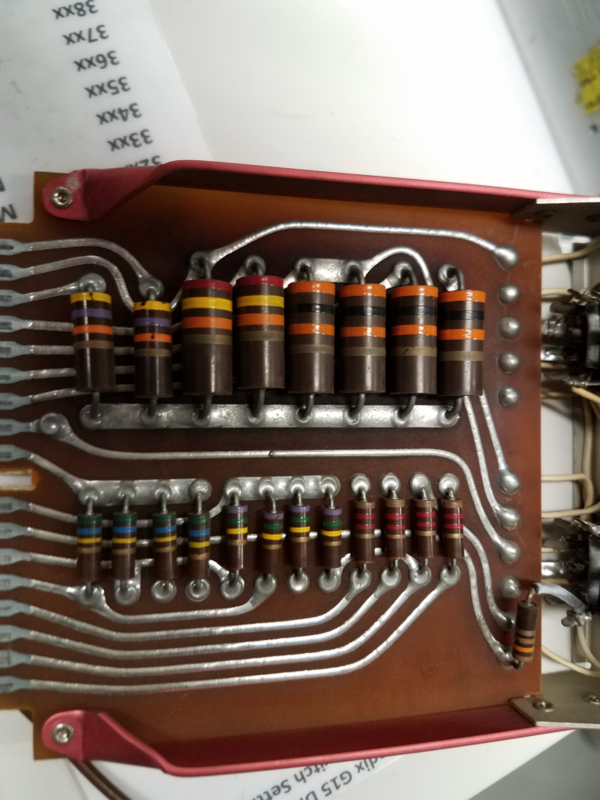 The Accumulators in most PDP10’s live in special logic inside the CPU, called “Fast Accumulators”. I had to steal a board from one of the other 2 KA’s that came with KATIA, in order to get the Fast AC”s to work. I then started poking at the MG10 128K word memory box we had hooked up to KATIA. I got 32K of it working, and that was enough to run the paper tape diagnostics. Had to replace the light bulb in the card reader. Now to check the adder: I loaded the two instructions with the front panel, and no, the adder wasn’t working. It couldn’t propagate a carry past bit 20. 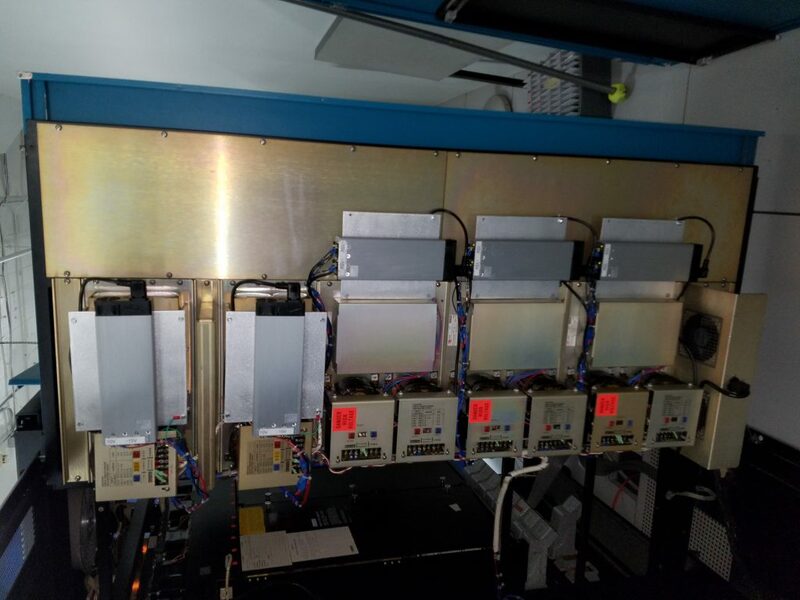 After a bunch of poking around I found that there was some kind of a connection problem between cards 2A29 and 2A30, which are in chassis 2 (the middle one), on the top row, about 3/4 of he way from the left. Swapping them and swapping them back seems to fix it. After about another 4 weeks, with plenty of tearing of hair and gnashing of teeth, lots of board swapping and transistor changing, I finally got KATIA to run the KA versions of diagnostics that we run from paper tape on the KI! From that point the tapes get too big for the paper tape reader to handle easily, so on the KI we run those from the DECtape drives. It took another couple of weeks to get the DECTape drives and controllers working on both the KA and KI. We needed the KI to work so that we could write the proper diagnostics onto a DECtape for KATIA to read. The problem with that, is that the KI hasn’t been able to boot in a few months. It passes all the paper tape diagnostics, but there is something fishy with the disk interfaces. Bother! I fixed the rest of the MG10 so we had 128K words of memory working. While I am working on the KI on a Thursday afternoon, it gets decided we should get KATIA down from the 3rd floor, and on display in 2nd floor computer room before opening on Friday! 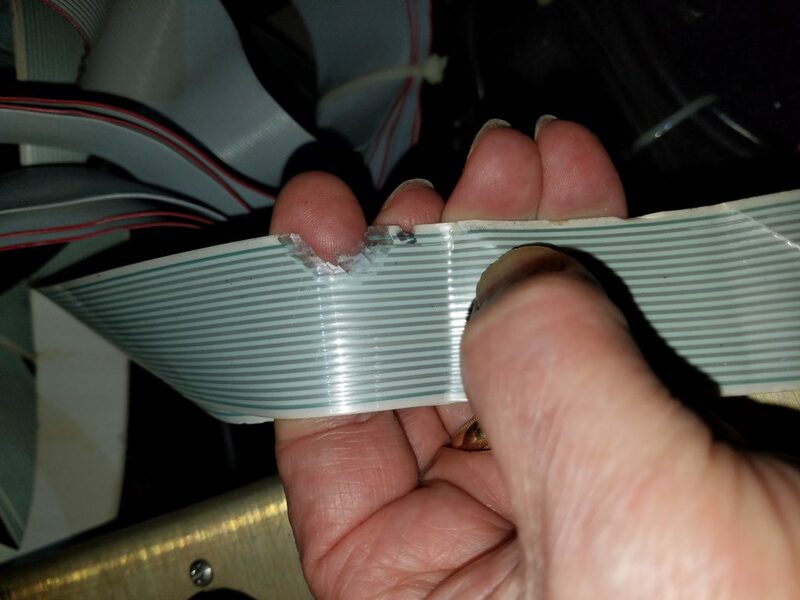 This involves detaching the DECtape cabinet from one end, the memory from the other end, and disconnecting a whole bunch of cables that go between chassis 3 and the other two chassis’. 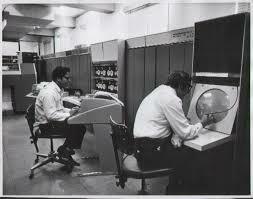 We also have to make space by moving the IBM 360/30 out of where we want to put KATIA. We start by disconnecting all the required stuff Thursday afternoon, and getting the 360/30 put back together enough to move, and we move everyting. By Friday all KATIA’s boxes have power again, and I carefully put all the cables back where they came from the day before. Half of the Museum shows up for powering up KATIA in its (her?) new home. I turn it on, and poke the Read-In button to load up my simple memory diagnostic, and… nothing happens! Has the adder stopped working again? Well, yes. I wiggle the cards, and voila, KATIA can add again. Yay! I poke the Read-In button again and… not nothing! 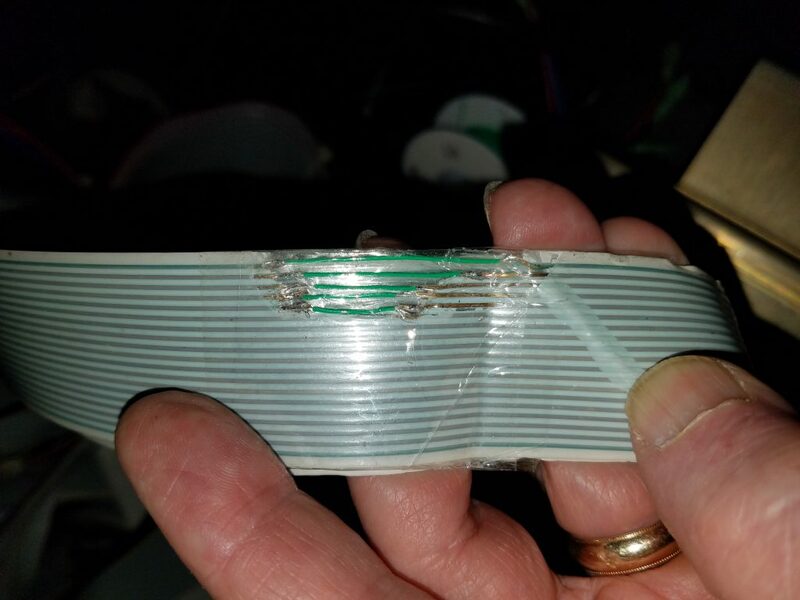 The tape goes through the reader, but the lights keep incrementing, even after the end of the tape has fallen out of the reader. THAT is not Correct! Finally on Friday morning two WEEKS later, I have grovelled over the gospel according to DEC, and abased myself before the computer gods to almost understand how Read-In is supposed to work. Hmm, is that a string to pull on? Read-In works by loading a BLKI instruction into the instruction register of the machine and executing it. PDP10’s are NOT Reduced Instruction Set Computers! The BLKI instruction reads a memory location, a pointer, adds 1 to each half of the data there, puts it back in memory, then does the I/O instruction implied by the “I”, uses the right half of that memory location to point at where in memory to put the data it read from the paper tape reader. Then it looks at the left half of the pointer, and if it is zero, it skips the next instruction, if it wasn’t, it will execute the next instruction. As I was watching it try to do this with the oscilloscope, it didn’t appear that the part where it was reading the pointer location was taking as long as it should have, considering that pointer was located in core memory at the time, and reading and writing it should have taken a whole micro-second! The I/O instruction was decoded over in chassis 3, but the instruction timing and memory control was over in chassis 1. Eventually I noticed that the part of the instruction it was skipping was the memory access, which was supposed to be started by a signal called “IOT BLK”, which wasn’t making it to chassis 1. I could see it in chassis 3! The chassis 3 end of the cable had been loose to move the machine, let’s take a look! Cable 3E06. 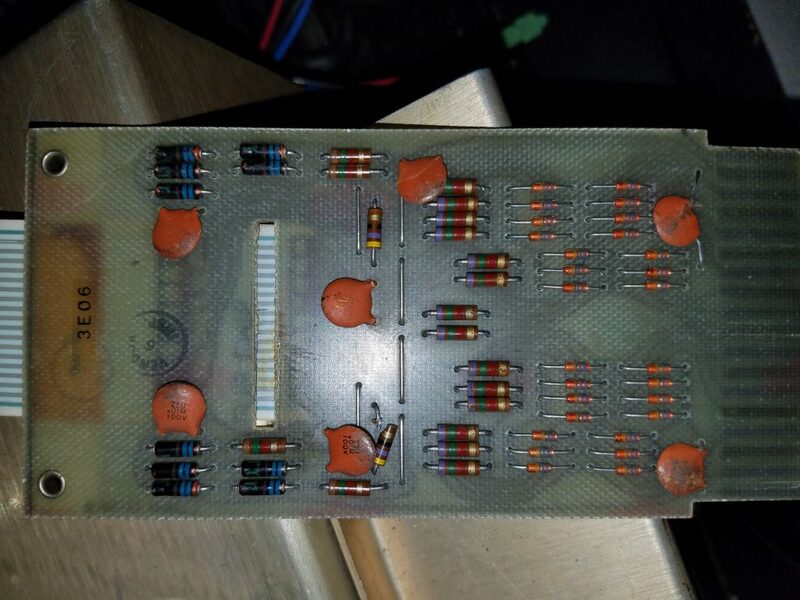 Note broken resistor near the bottom middle of the card. I replaced the broken resistor, but it still didn’t work! OK let’s look farther up the cable, did anything else happen in the move? That doesn’t look right! I suspect that somehow, in the move, this cable escaped momentarily enough to get caught under a caster and rubbed away, because it used to work, and the signal in question is one of the top two signals in the cable. The consequences of doing things in a hurry. Do I pull this cable from one of the other machines we have or do I try to repair it? As soon as this was done, KATIA went back to behaving for me. I ran all the diagnostics we had run, and a few more that we ran from DECtape on the KI, till I got to the one that also failed on the KI. We found the locations in this one that we had to patch for the KI, and it now runs too! Did I get it done in 3 weeks? Unfortunately no, so Paul Allen didn’t get to see it run, and play with it. He must have known back when he asked about 3 weeks, because it was very close to three weeks from then that he left us. KATIA: For you Paul! Sorry I didn’t get it working in time. 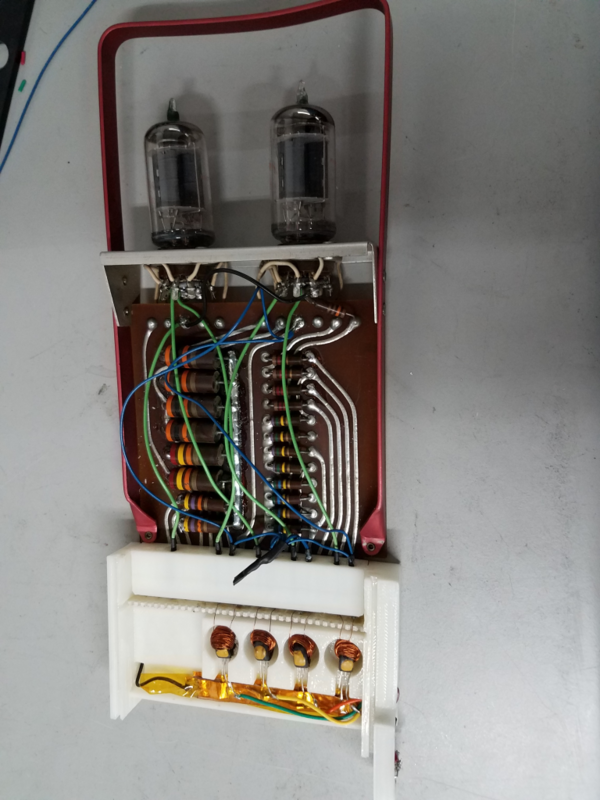 In the process of restoring the Bendix G-15, we have discovered a phenomena that degrades the electrical connections which provide bias and signal flow, rendering the computer non-functional. Below is a group of photos which illuminate this failure mode called “electromigration”. This process is caused by a continuous DC potential applied to a metal junction. Metal ions migrate in the direction of current flow. For most new machines, this is not a problem as this process takes quite a number of years to progress to the point where the electrical connection is broken. At LCM+L, we get machines after they had run for a long time. Worse yet, since it is our intent to restore and run the machines for as long as we can, it is necessary to find a solution that allows that maintenance need only be done every decade or so. A failed connection ( as verified with an ohmmeter ). Please note the circular crack running around and just above the base of the circular conductor. This one hadn’t quite failed. You can see just a small connection at around 260 degrees. This connection will fail in a fairly short period of time. This same phenomena plays out in the metal structure of the solder itself. 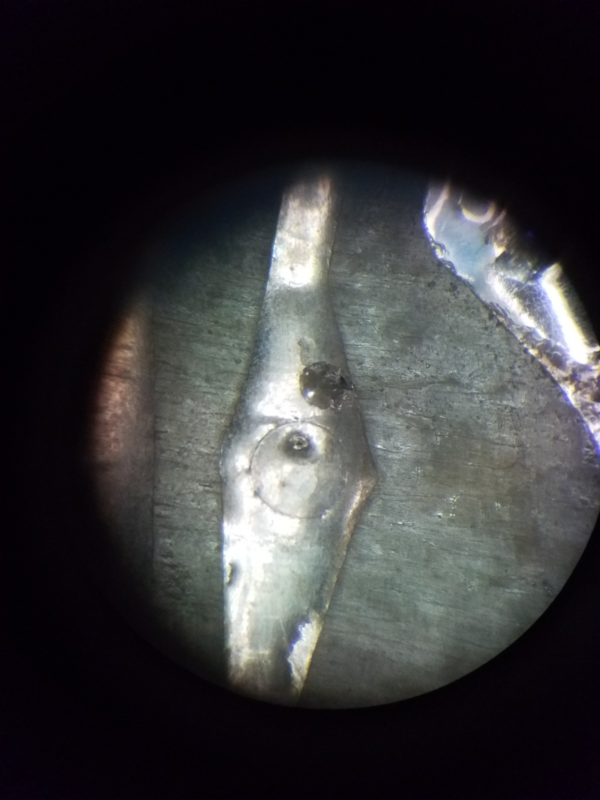 The photos below show the before and after of solder restoration. In the first photo, the solder looks dull and mottled. This is due to the tin having migrated out leaving only lead in the Tin/Lead solder formulations used until the early 2000’s. The modern formulations are Tin/Silver/Copper and are much less likely to have metal ion migration. The large resistors at the top show the effects of tin migration. 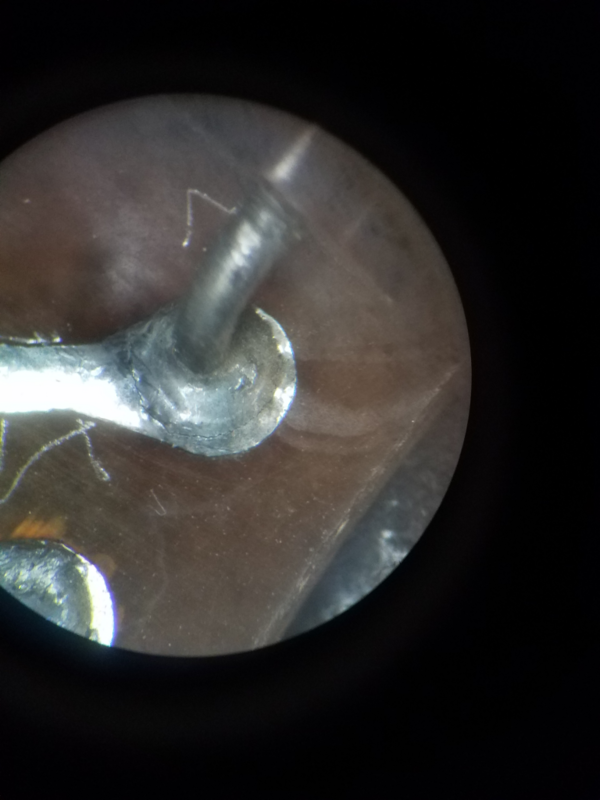 After removing the old solder and replacing it with a modern formulation, you can see the solder is smooth and bright, indicating good integrity. This restoration process took quite a while. 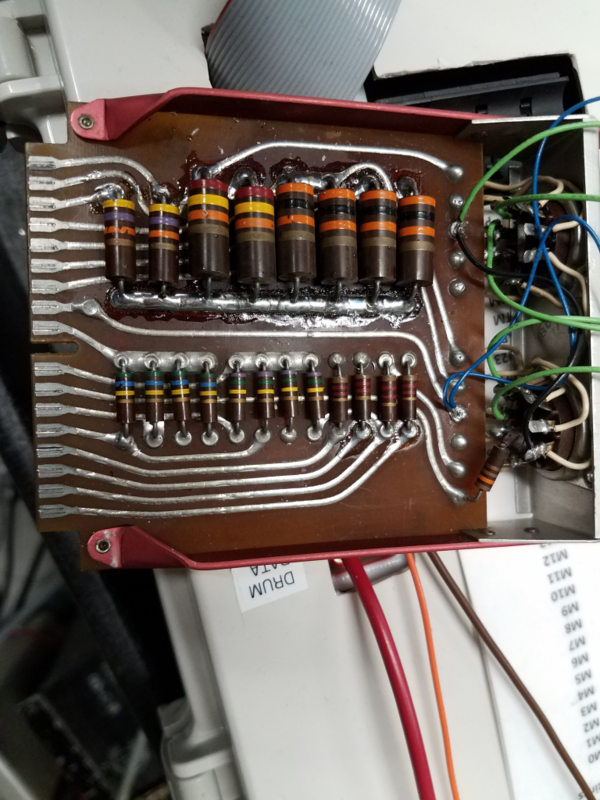 After determining that all the tube modules in the machine were affected in this way, we simply set about removing a module and then removing and replacing the solder in all the high, continuous current sections. In my last blog on the CDC, we were having a slow refrigerant leak in Bay 1, and we were waiting for parts. The new parts came, but they were wrong, then they came again, and they were wrong again. Eventually the right parts were delivered, so we took the CDC down yesterday morning to work on the cooling system. Cole, from Hermanson, arrived at 7AM, and we proceeded to shuffle some of the chiller plumbing around, so I can always be able to restart the computer after a power fail, and it took about an hour, and seems to work fine! The old compressor in the basement, showing where the power goes in. A little later, Jeff Walcker, also from Hermanson arrived to install the new compressor parts that had arrived. We opened the 3phase 60Hz breaker for Bay 1, and Jeff started un-hooking the power. We had discovered that it was leaking where the compressor power wires go into the case. As Jeff was taking it apart, all the little bits were turning into powder. The compressor is 52 years old. It was decided that we needed a new compressor. Bummer! Contrary to recent experience, not only was a replacement compressor available, it was in stock, IN SEATTLE! Jeff was back from getting it almost before we were done deciding that was what we should do! Compared to 102 days for the chiller, this is amazing. He did a bunch of wrestling with the compressors to get the new one in, and we don’t have the motor cooling loop hooked up yet, because the pipe didn’t want to go on the new one quite the same as it came off the old one. 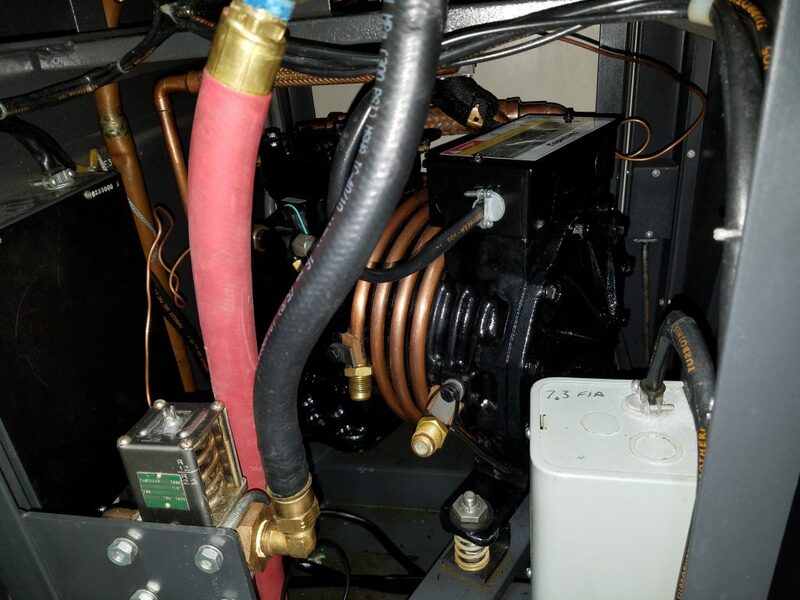 You can see the disconnected copper cooling loop wrapped around the compressor in the above picture. Jeff will bring a slightly longer hose when he comes for our quarterly maintenance next month. The CDC is happy again, and hopefully not leaking! 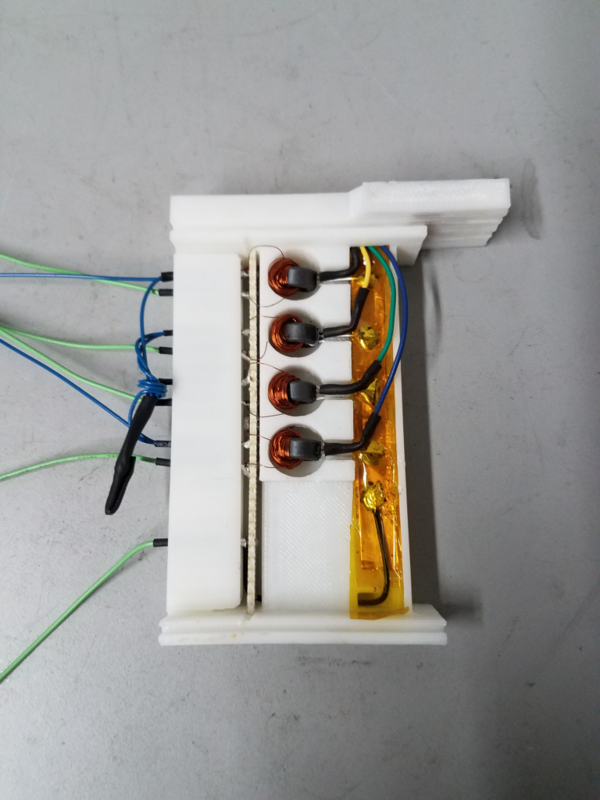 We created, using a CAD program and a 3D printer, a plastic component mounting for the new components. As you can see, the plastic mount fit perfectly into the old power module frame. After populating the mount with all the components it looks like this. Now we attach the modified heat sink to the original module frame. 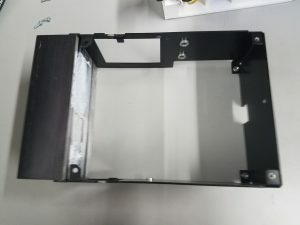 Install the assembled component mount in the frame along with the modified heatsink and the new power module is complete. 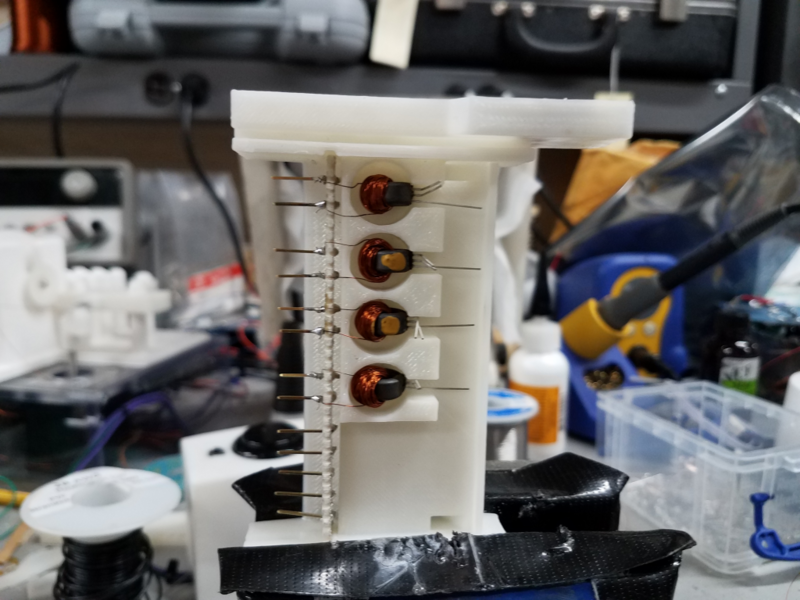 One of the features of the module is, it has no solder connections, all of them being compression. 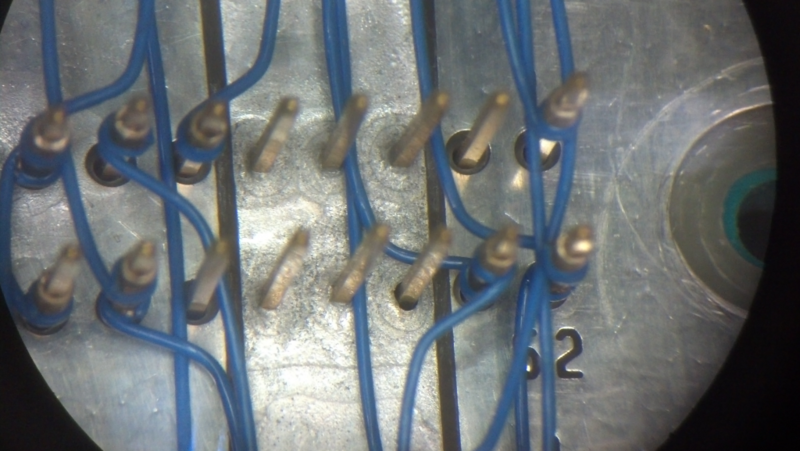 Wires are compressed into a square cross section using a stainless steel screw. This provides very high reliability. The upshot of all this work ( there were 38 modules in various machines ), is power supplies that are more efficient and have a rated MTBF ( mean time before failure ) of 40 years. These power supply modules draw 2/3 less power and produce 2/3 less heat, reducing the heat load on all the components in a machine. In addition, as a result of these changes, the total power savings per year is 250,000 kilowatt hours. Electricity rates in this area of Seattle are about 8 cents/kilowatt hour. That means a direct cost savings on our electric bill of $20,000 a year. 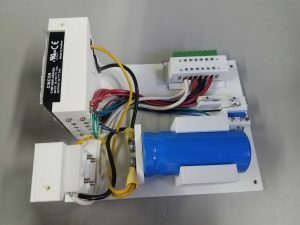 The CDC 6500 has led a rough life over the last 6 months or so: way back on the afternoon of July 2, 2018, I got an email from the CDC’s Power Control PLC telling me that it had to turn off the computer because the cooling water was too hot! A technician came out and found that the chiller was low on refrigerant. He brought it back up to the proper level, and went away. Next morning it was down again. After much gnashing of teeth and tearing of hair, it was determined that the compressor was bad in the chiller. “We’ll have a new one in 5 weeks!” The new one turned out to be bad too, and so another was ordered, that was easier to get. Only about 3 weeks, instead of the 8 that the official one took. That worked for a few weeks, and the CDC went down again because the water was too hot. This time it was very puzzling because as long as the technician was here, it worked fine. He spent most of a morning watching it, decided it was OK, and left, but he didn’t make it to the freeway before it went down again. He came back, and watched for the rest of the afternoon, and found that the main condenser fan would overheat, and shut down, causing the backup fan to come on. The load wasn’t very high, so the backup fan had to cycle on and off, while the main fan motor cooled off. This would go on for a while, till both motors were off at the same time, and then the compressor would go over pressure because the condenser fans were off, and the chiller would stop cooling, resulting in the “Water too HOT” computer shutdown. Another week went by waiting for replacement fan motors from the chiller manufacturer, with no luck. Eventually we gave up and got new fan motors locally, installed them and the chiller has been working since. While the CDC didn’t seem to mind being off for 102 days for the compressor problem, it didn’t like being off for 3 weeks while we fiddled with the fans. Both when it was off for 102 days, and this time, we found that Bay 1 was low on refrigerant. 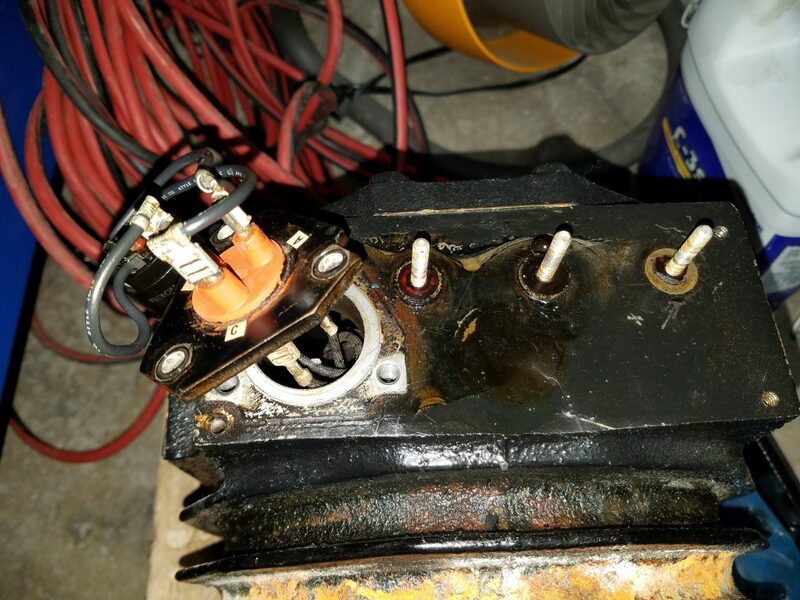 The first time we just filled it up, but the second time we looked closer, and found that there is a small leak where the power wires go into the Bay 1 compressor. The compressor manufacturer, the same guys that made the chillers compressor, will gladly sell us a new compressor, but the parts for the 50 year old, R12 compressor, are no longer available. We are working on that, but I haven’t heard that we found the parts yet. Back to more recent times: now that the chiller is chillin’, and the CDC’s cooling system is coolin’, why isn’t the computer computing? Let’s run some diagnostics and see what happens: I try to run my CDC diagnostic tape, but the machine complains that Central Memory doesn’t seem to be available. No, I didn’t run the real tape drives, I ran the imaginary one that uses a disk file on a PC to pretend to be a tape drive. Anyway, that didn’t work, so I flip the zillion or so Dead Start switches in my emulated Dead Start panel, to fire up my Central processor based memory test, and get no display at all! This is distinctly unusual. Let’s try my PP based Central Memory test: That seems to work till it finishes writing all of memory, then the display goes blank. Is there a pattern here? I put a scope probe on the memory request line inside the memory controller in Chassis 3, and find that someone is requesting memory every possible cycle. There are four possible requests: the Peripheral Processors as a group get a request line, each Central Processor gets a request line, and the missing Extended Core Memory gets a request. Let’s find out who it is: the PP’s aren’t doing it, neither of the CP’s are doing it, and the non-existent ECM isn’t doing it. Huh? Nobody is wants it, but ALL of it is getting requested! I am going to step back a little bit, and try to explain why it sometimes takes me a while to fix this beast. This machine was designed before there were any standards about logic diagrams. Every manufacturer had to come up with their own scheme for schematics. Here is one where I found a problem, but we will get to that in a bit. Now when there are two squares with one above the other, and arrows from each going to the other, those are flip-flops. When you have a square, or a circle with multiple arrows going into it, that is a gate. Which one is an “or” gate, and which one is an “and” gate? Sorry, you have to figure out that for your self, because the CDC documentation says either one can be either one. The triangle with a number in it would be a test point on the edge of the module. The two overlapping circles, kind of like an elipsis, indicate that is a coax cable receiver, as opposed to a regular twisted pair signal. A “P” followed by a number indicates a pin of the module. This module receives the PP read and write signals from the PP’s in chassis 1, on pins P19 and P24. On the right side of the diagram, you can see where all the pins connect. 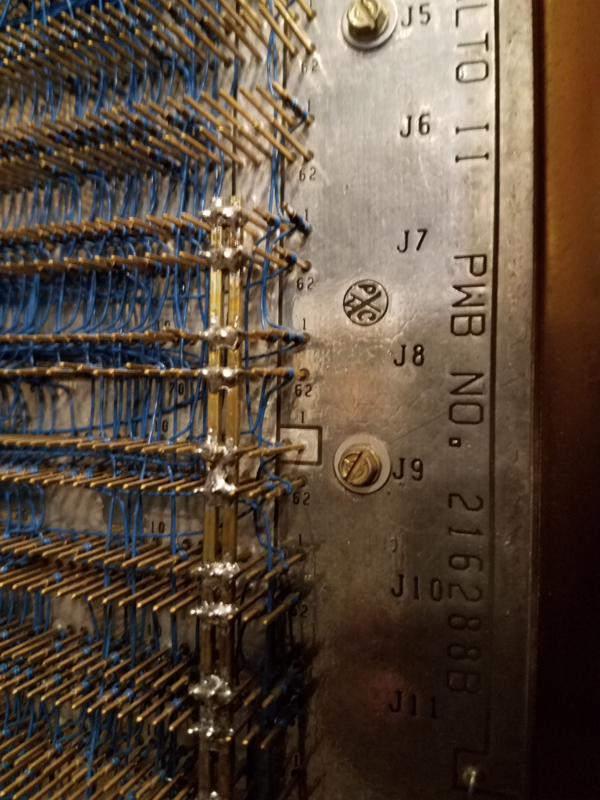 If we look at pin 24, we can see it connects to W07 wire 904, and pin 19 is connected to W07-903. The W “Jack”s are coax cables, the other letter signals go somewhere inside this chassis. Really, what we are looking at here, is that a circle, or a square is the collector pull-up resistor of one or more silicon NPN transistors. 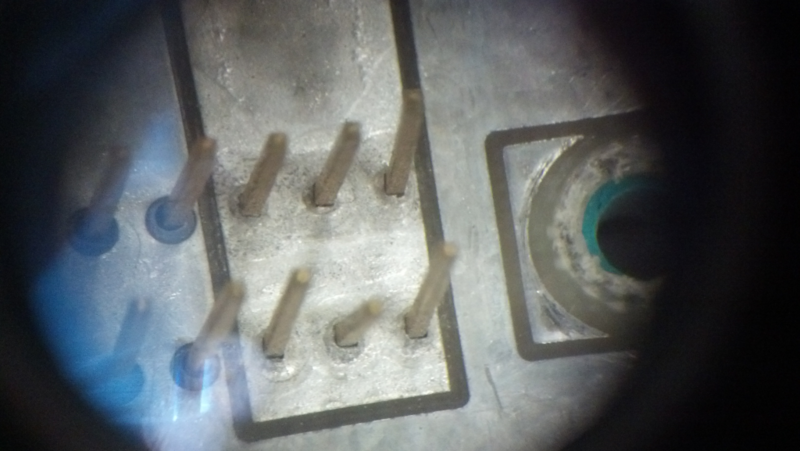 the arrow heads are the base of the transistors, and the line coming into the head has a base resistor in it. If there are three arrows coming into a square, like at the bottom, those three 2n2369 transistors all have their collectors tied together, with one pull-up resistor. I could be slow, because it took about 6 months before I felt I was at all fluent in reading these logic diagrams. Now we have to talk about the Central Memory Architecture a bit. The CDC has 32 banks of 16K words of memory. Each of these banks is separate, and they can be interleaved any way the 4 requestors ask for them. At the moment, I am only running half of them, because there is something wrong with the other half. Each of these banks does a complete cycle in 1uS. The memory controller in chassis 3 can put out an address every 100nS, along with whether it is for a read or a write. This request goes to all banks in parallel. If the bank that it points to is available, he will send back an “accept” pulse, and that requestor is free to ask for something else. If the controller doesn’t get an “accept” he will ask again in about 400nS. There is a bunch of modules involved in this dance, and it is a big circle. A little more background: This machine was designed before there was such a thing as plated through holes on printed circuit boards. The two boards in each module were double sided. 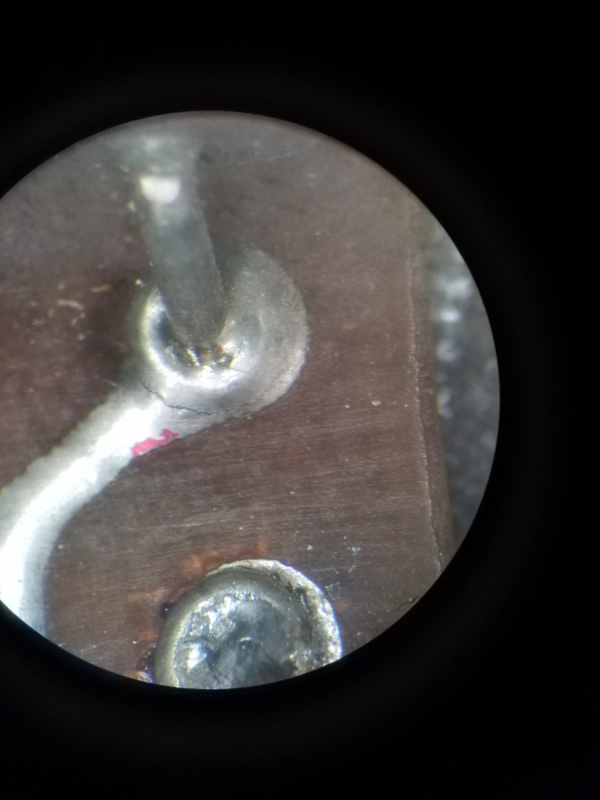 What they did when they needed to get to the other side of a PCB, was they would put a tiny brass rivet in the via hole, and solder both sides. What I eventually found was that the signal from P23 of the module in 3L34, wasn’t making it to pin 15! There was a via rivet that wasn’t making its connection to the other side of the board. I re-soldered all the vias on that module, and now we were only requesting memory when someone wanted it! Now that we can request memory and have a reasonable chance of it responding correctly, it is on to testing memory. I loaded up my CP based test, and it ran… for a while. Then it quit, with a very strange error. The test uses a single bit, and its complement to check the existence of every location of memory. It will read a location, and compare it with what should be there, and put the difference in a second register. Normally I would expect a single bit error, or maybe 12 bits if a module failed that way. The result looked like 59 bad bits, or the error being exactly the same as what it read. Usually this is because the CPU that is running the test is miss-executing the compare instruction. While I was thinking about that, I ran Exchange Jump Test to see what that said. A PP can cause a CP to swap all its registers, including the Program Counter with the contents of some memory that the PP points to. This is called an Exchange Jump. The whole process happens in about 2.6uS as it requests 16 banks of memory in a sequence. This works the memory pretty hard. Exchange Jump Test (EJT) would fail after a while, and as I looked at the results, I noticed that it was usually failing a certain bit in bank 7. I checked, and noticed it was an original memory module, so I looked at my bench and found I didn’t have any new ones assembled, so I had to put the sides on a couple of finished PCB assemblies, and test them. I then swapped out the old memory in bank 7 with a new semiconductor memory, and EJT passed! I then checked to see if my CP based memory test worked, and it did too. We are back in Business after over 5 months. I am keeping my fingers crossed in the hope that the chiller stays alive for a while. My last article explained that the DEC 340 Monitor pointed at and shot dots from an electron gun to light up spots on its screen. That was my magic chant, the method of how the DEC 340 drew its pictures as a collection of dots. Into the deep sea must be buried. Or else I won’t get it done. I don’t have full documentation and parts are missing. It is a puzzle I don’t have all the pieces for; the challenge of coming up with missing puzzle pieces and getting them to work and fit together, inspires me, but that’s not enough. It must consume me with passion! A hero’s journey has begun and heroes can’t be distracted. There is no time for it. The devil is in the details and there are a lot of details in this project. Trying to keep track of all of them is challenging so I make it fun. This blog series will catch up to the actual work of that challenge later but for now I need to describe the scenery a bit more. I hope a transistor will appear in my next installment but I have to set the background for them or they aren’t very interesting characters. They can be captivating entertainers but you have to get them in the right venue or they won’t amuse. More background is needed. Designing the original DEC 340 may have been an easier job then mine. Don’t think that is a complaint, it is only an observation. The DEC 340 circuits were already in use in a preceding DEC monitor, a monitor that DEC designers had full documentation for. This was a monitor they could touch and turn on. The designers had drawings and net-lists which described how all the plug in System Design Modules were interconnected to create the monitor. The most useful document I have, is this one. Many thanks to a reader who upon reading the first article of my series supplied this link. The copy I had must have been a copy of a copy of a copy and was relatively illegible. This one is crisp and clean. Many thanks. The document is a maintenance manual intended for limited distribution. It has a lot of good information but it is not an engineering file that would have everything I need to know to reconstruct a DEC 340. It contains documents which give a good understanding of how the DEC 340 works. It is detailed enough to perform maintenance on the machine. 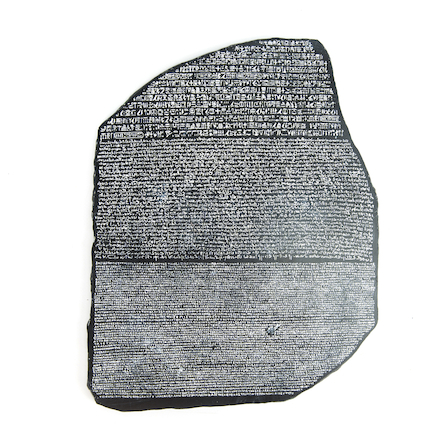 It’s my Rosetta Stone. I’m using it to translate old to new, after enough pondering and understanding. DEC engineers had all the bright and shiny System Design Modules that they needed, building blocks from which the DEC 340 is made. The DEC 340 was an evolutionary design which evolved from the DEC 30E, an earlier DEC monitor. The original 340 design did not start from scratch. The designers had a working monitor and a clear goal. I have a DEC 30E manual similar to the DEC 340 manual. It has information that describes some of the missing chips off my stone. The goal seems to have been to improve DEC 30E performance. Other considerations may have motivated a new design, but circuitry differences tell me that performance enhancement was the big goal. The 340 was built on top of the 30E design. The DEC 340 has additional circuitry the 30E did not have but all the tube driving circuits the DEC 30E had were found inside a DEC 340. A 30E is shown at the top of this article playing Spacewars. The DEC 30E used the same tube as the DEC 340 and a 30E manual was good to find. It documents the tube neck circuitry better than the 340 manual does. It may be that designing the 340 was an easier job because the 30E monitor already existed but I’ll guess the original 340 designers were also told something like, ‘you’ll have it done by next Tuesday right’? That not actually being a question. A complication of course, which at the end of the day would make their job a lot harder than mine. Especially if tomorrow were already Tuesday. The 30E used the DEC point and shoot method of drawing dots on its screen like the DEC 340 and later DEC monitors did, but the 30E could not show as many dots on a screen as a 340. The DEC 340 uses tricks to get more dots on its screen. Displaying Spacewars makes for a great photo, but I don’t see a star field of dots as much of a performance test. I’d like to see how it did at rendering a few sentences. I suspect a few sentences would push 30E hardware to it’s limit. Magnetic deflection of Cathode Ray Tube beams is band limited. Band limited means the yoke magnetic field can’t be changed as fast we need it to be, to steer a pointed-at spot around as fast as we want. Spending a few moments considering how many dots are in a picture made up of all dots, and how much time is allowed to draw them all to prevent screen flicker, shows how fast an ideal DEC 340 tube yoke needs to be. In a DEC 340, a square in the center of the CRT is used for display. It is a little less than 10 inches on a side, and each point in the square has a unique ten bit X and Y address. Ten bit addressing allows for 1024 X and 1024 Y values. Spots outside this center screen square can’t be pointed at. If only one fiftieth of a second is allowed before a screen must be redrawn or it flickers, an all white screen needs to point and shoot at more than fifty million dots in a second, because there are over a million dots in an all white screen. This allows for less than twenty nanoseconds of time to draw a dot. Point and shoot magnetic deflection can’t keep up so an all white screen on a DEC 340, that does not flicker, is impossible. But a whiter screen than that which can be drawn on a DEC 30E is possible with a DEC 340. Improvements were made. In the computer room at the Living Computer Museum, in Seattle Washington, there is a CDC 6500 with a working DD 60 display attached. The tubes in that display use electrostatic deflection, which does not have the inherent bandwidth problem that magnetic deflection has. The DD 60 displays are also large pieces of furniture. A tube which uses electrostatic deflection has to be about three times longer than it is wide or the electron beam will only make a small square in the center of its screen. An electron beam has only a very brief time in which to be deflected as it passes between two electrically charged deflection plates, the resulting deflection angle is limited. 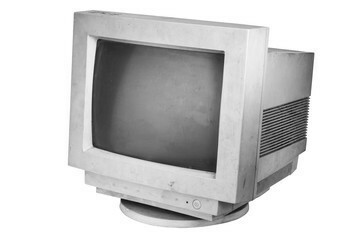 A vintage monitor made by Hewlett Packard, the HP 1300, got around the geometry problem by a special (and patented) innovation, a special grid inside its CRT which enlarges a picture on the screen. The Living Computer Museum has a DEC PDP computer with a working HP1300 attached. It is a custom implementation used at the University of Oregon as a research device for many years. The HP1300 was a monitor, but it was not a computer monitor. The HP1300 requires external X and Y voltages with a gate signal to move the beam around and to turn it on and off. 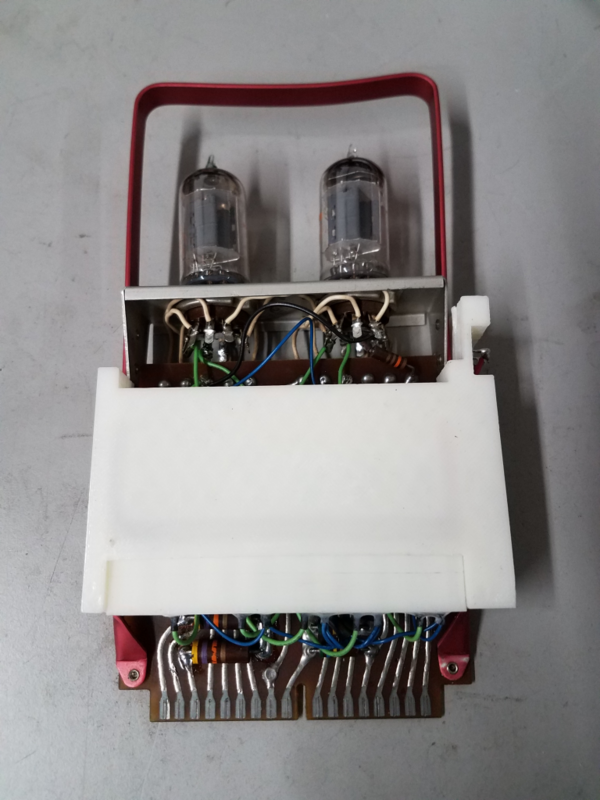 The CRTs in HP1300s look like old TV tubes, wider than they are tall, but internally they are more like oscilloscope tubes with electrostatic deflection plates. To me, they have a one of a kind special delight because of the innovation. Electrostatic deflection, for whatever reason, was not an option for DEC, so the best that could be done with magnetic deflection was attempted. The goal was to make something useful. Thinking of a computer monitor as a device to represent photo images, and not as something that only outputs useful data at the time, was a figment of somebody’s imagination. Probably more than one somebody had the same figment, but practically it was for the time, a wild dream. Digital images could not be read from a sea of cheap memory as they are today. At the time the DEC 340 was made, everything in an image was programmed. There were no digital cameras. Computer monitors were a different animal and people thought of them totally differently than they do today. Drawing a line took time, Drawing two lines took more time. Not everything in a picture had the same ‘cost’ but all modern computer monitor pictures do have the same ‘cost’, a cost that modern hardware has no problem keeping up with. The time it takes to read a image from memory. Things were different in the days of tube monitors like the DEC 340. A DEC 30E takes thirty five microseconds to set X and Y magnetic fields to point to a spot on the screen. With 1048576 points in a square, that is more than 1000 times slower than we need to light up every point in a display screen square sans any flicker. I guessed at fifty refreshes a second, but that is a reasonable guess. Improvement in response time is obviously desirable, and a 1000 to 1 ratio is a lot of room for improvement. Is the picture as bleak as it could be? The answer to that question, it turns out, is no. A DEC computer at the time, would need several microseconds to set X and Y values of a point. Several microseconds is not a lot different than the 35 microseconds it takes for a 30E magnetic field to settle on a pointed-at value. Certainly a lot less than a 1000 to 1 ratio. Not much 30E speed improvement is needed before a DEC computer that a DEC 30E attached to limits performance not the 30E monitor. This is similar to the weakest link in a chain being the link that defines how strong a chain is. Magnetic deflection would not be the limiting factor once the 30E could be made to outperform a DEC PDP computer. The DEC 340 attempted to implement that improvement. Two different things were done to get more spots on the screen. The response time to settle the magnetic field between adjacent points was reduced by blending an open loop response with a closed loop response. That’s engineering talk most of you won’t have a clue about understanding and I’ll let that be my concentration the next time I write an article installment. The 30E was an entirely closed loop device. I’ll let that be my first sentence for the next installment. I’ll go from there. The second thing that was done was to make the interface between the DEC 340 and a host computer more elaborate so entire lines could be easily described. A program that draws lines and dots is going to obviously be shorter than one that draws just dots. The DEC 340 takes line segments and calculates point positions on these lines by itself, to draw the lines as points. The DEC 340 is a programmable device able to take some of the burden of ‘vector’ programming away from the host computer it’s attached to. The DEC 340 could be set in different modes to ease information transfer between its host computer and free up CPU clock cycles. Description of these modes will wait for a future day because that has to do with device logic, for now I’m concentrating on the electronics that drive the CRT. Once DEC marketing saw something describing improved performance, I’ll guess pressure to ‘ship it‘ inside the DEC eco-sphere must have been intense. Getting into the details of the electronic circuits that produce that magnetic deflection speedup, I’ll do in my next installment. Previously I introduced my DEC 340 monitor restoration project. I promised then to describe how the DEC 340 monitor worked. I will, but that explanation won’t mean much without some context first. After the context the special magic that makes the DEC 340 different from other computer monitors will be revealed. High definition images are ubiquitous now and a comfortable magic hides the mystery and complexity of what it takes to show a picture on a computer screen to us. High definition images are everywhere and they use a refined magic that took a century to evolve. The story began in 1869 with the Crookes tube. The DEC 340 monitor story is part of the story of this magic. The technology used in the DEC 340, a few steps back from what we now have, had limitations unknown today. My personal fascination with the DEC 340 is about what was done to overcome these limitations. Today’s flat panels depend on high speed digital electronic circuits which did not exist when the DEC 340 was built. These circuits would later become the technical background of modern computing as we know it and without them computers as we know them could not exist. 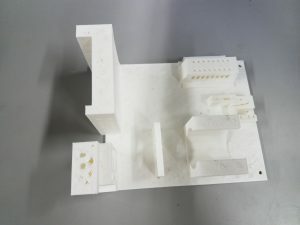 Cheap memory, being able to hold a supercomputer in the palm of your hand, the ability to process images in real time, and the ability to make flat panel monitors with high definition images all resulted from the revolutionary technical innovation of packages of small high speed digital electronic circuits. Today’s world has the technology to give us realistic images but in the world the the DEC 340 comes from nothing much better could be done. The DEC 340 used discrete components, the only available. A cell phone today made from similar discrete components would be as big as a car and would cost more. It also would not work. 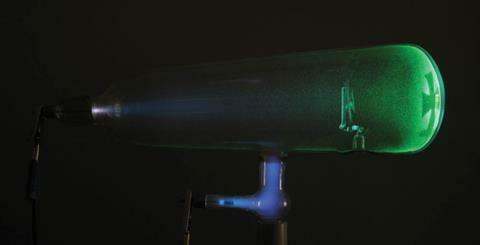 Size and the speed of light would prevent its circuits from operating fast enough to do the jobs they need to do. In electronics where speed is important, size matters and smaller is better for high speed. Two components in the DEC 340 are huge. The radar tube and a magnetic yoke around the radar tube neck that steers an electron beam around to paint a picture can’t be made smaller. The size of the magnetic yoke limits the complexity of an image which can be drawn. Yokes have a property called inductance which I will describe, and inductance goes up with size. Inductance slows things down. This will be important later. 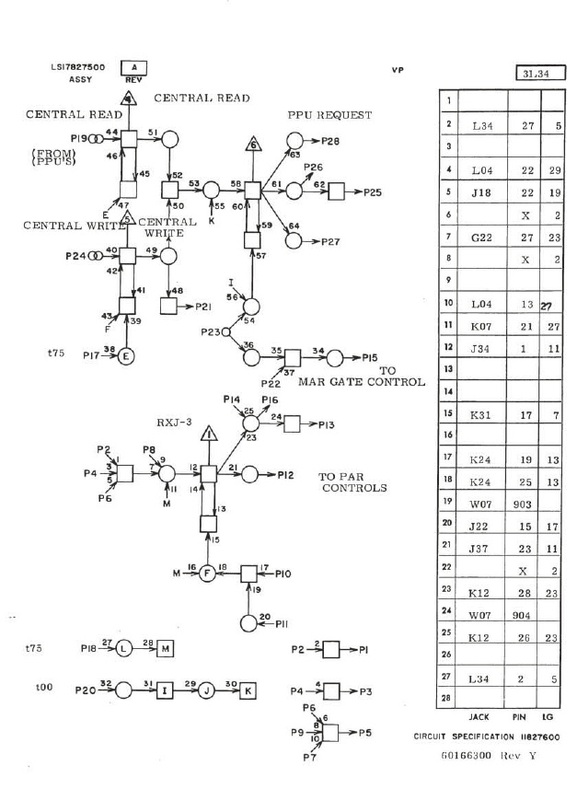 I look at the DEC 340 circuits. They are fascinating just the way they look but the more I study them the more interesting they get. Component colors on the parts don’t get brighter, the metal shinier, or anything like that, but my appreciation for these circuits grows with time. The circuits are not sloppy. 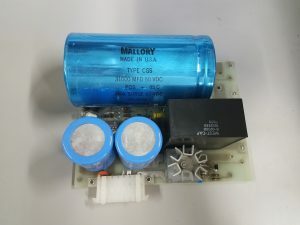 Lots of effort went into their design and they pushed the limits of what could be done with bipolar transistor technology, then, and even now. These circuits had to do as much as they could in a very short period of time. They were designed to push the limit of what can be done. Between today’s flat panels and the DEC 340, computer monitors of a different kind existed. These monitors were raster scan devices. They used Cathode Ray Tubes CRTs like the DEC 340 did but these tubes were like old TV tubes and worked the same basic way. Internal storage of pictures in computer memory files even today reflects a raster-like form. Information off picture files once had to be read sequentially to form lines for these raster scan monitors. The information was stored in a way that directly supported raster-scan formats. Raster scan monitors are a link between monitors like the DEC 340 and the computer monitors we have today. Raster scan monitors would be the backbone of computer displays for many years and television did exist when the DEC 340 was built. But to use a television display with a computer needs cheap memory which had not yet been invented. 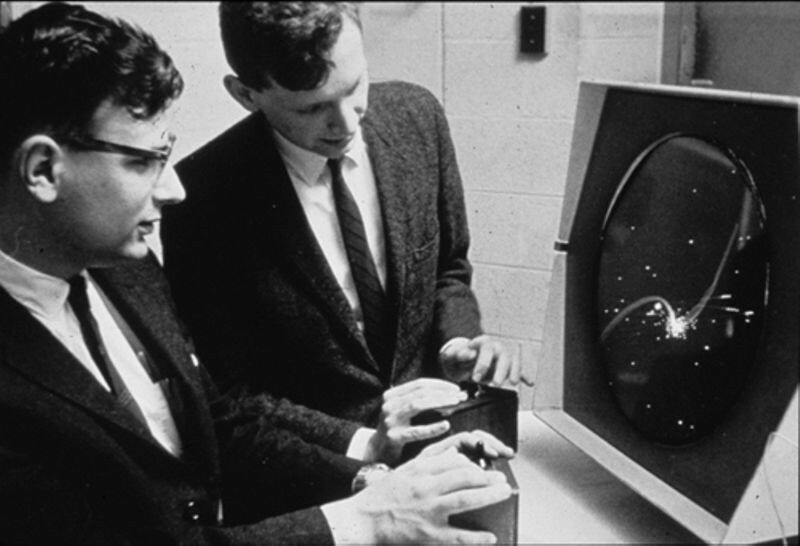 Raster scanning was not a viable option for computers in the early 1960’s. Memory cost too much. A bit is needed for every spot on the screen in a raster scan device. The DEC 340 screen would need to store 1024 bits for each horizontal line and there would be 1024 lines to read out in every scan. That would be 1048576 bits total. A trivial amount of memory today, but that is more memory than a PDP 7 even shipped with. PDP 7s only had 73728 bits or 4 K words on delivery. It could be expanded but only to 64 K words. TV of the era was an all analog process and involved no digital storage at all. 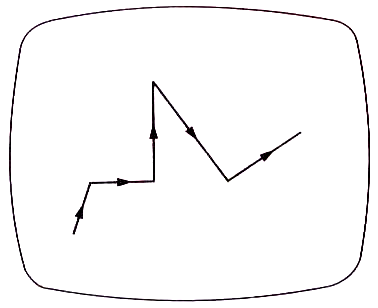 A TV camera recorded an image by tracing a raster on a camera screen and a receiver reproduced this camera generated raster on its screen in real time by duplicating the intensity variations produced at the camera. Video tape storage was possible but this only recorded an analog copy of an image and practically was only the same as a real time analog signal but delayed. A TV receiver could not tell the difference between the two. Digital manipulation of a raster image could not be done until enough memory was available to store an entire screen of image data so it could be later read out. It would take a few years before technology could catch up and provide enough cheap memory to store data for an analog video signal. Cathode Ray Tube monitors be they raster scan devices or devices like the DEC 340 have an electron gun that shoots a very thin beam of electrons down the center of the tube so that a spot in the center of the screen glows if the beam is on. Without a magnetic deflection yoke this spot would stay in the center of the screen and could not move. That is not very interesting, but for me it will be a very satisfying thing to see when I get that far. A magnetic yoke is needed to deflect the electron beam to other places on the CRT screen. 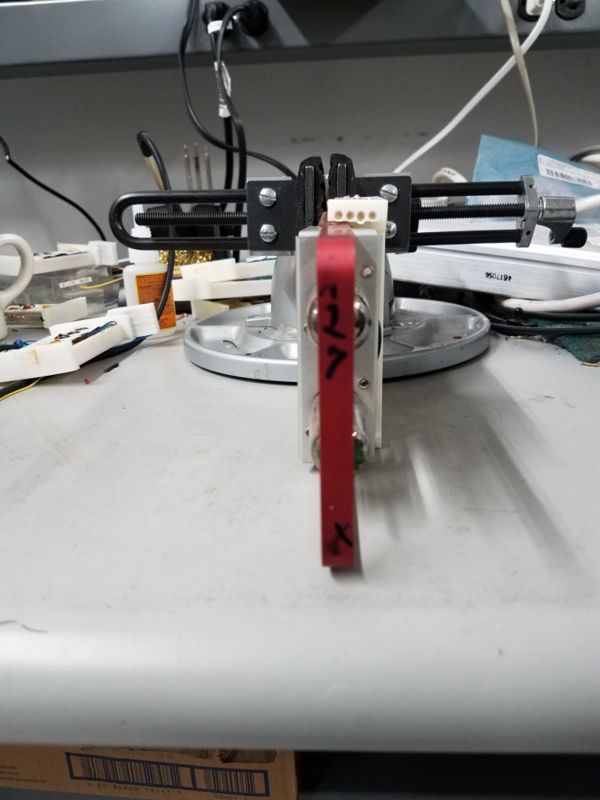 This magnetic deflection yoke moves the spot lit up on the screen around by current variations that change the magnetic field around the tube. Current changes can’t be made infinitely fast because the yoke has the property of inductance which I mentioned earlier and inductance tries to keep yoke currents from changing. Inductance is like momentum which tries to keep you going forward when you try and stop running. Inductance wants to keep current flowing like momentum wants to keep motion going. A CRT picture is made by moving the spot on the screen that is lit up around so fast its motion is invisible. The entire traced path looks lit up all at once. Turning the electron beam on and off while the spot scans turns the illuminated spot on and off. These methods mixed together allow an image to be drawn on a CRT screen. 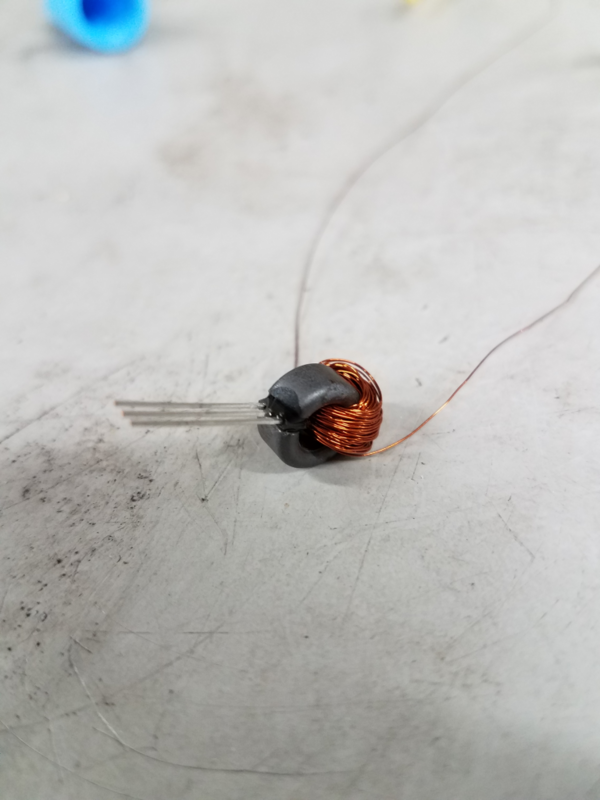 Inductance in the magnetic yoke limits how fast yoke current can change and the whole picture has to be redrawn as soon as the whole picture is finished being drawn or it blinks out. The limit on how fast the spot can move limits the complexity of any picture that can be shown. A raster scan covers the entire screen and breaks it up into horizontal lines. Inductance limits the number of lines that can be drawn but a useful number in a raster is achievable. All the electronics has to do in a raster scan monitor is reproduce the raster and turn the beam on where the picture to be shown overlays the raster. 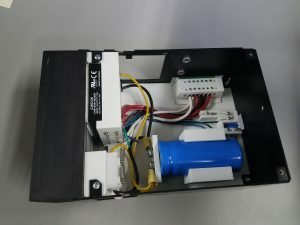 Picking a raster that electronic circuits can support easily can be a judicious choice making electronic design of a raster scan monitor a well defined problem. The raster is a repetitive pattern the yoke currents simply retrace over and over. This is different and simpler than what the DEC 340 does. The pattern traced depends on the picture in a DEC 340. The more complicated the picture the more complicated a pattern that draws it must be. Only a short period of time is available to draw a picture. A spot lit up by the CRT electron beam will go dark quickly once the electron beam is removed. For a picture to remain visible it must be continually redrawn. With only a short time to draw a picture before it has to be redrawn or the screen flickers, and with the complexity of a traced pattern dependent on picture content, DEC 340 electronics had to be made as fast as possible. Unlike a raster scan where good enough electronics is just fine. Unlike a raster device, positioning the electron beam is done by computer code running a computer program with instructions to control the DEC 340 in an attached computer. The decision to refresh the screen is also made by program code. 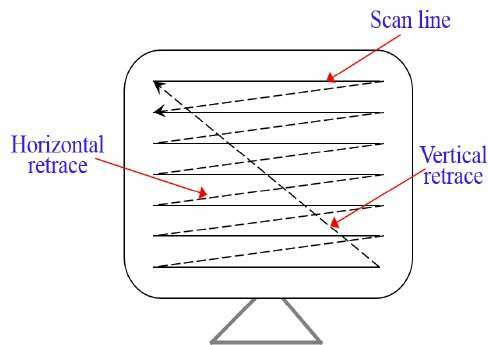 The alternative to a raster scan is called a random or vector scan because a vector monitor can draw an arbitrary line or ‘vector’ of any length in any direction starting from any point on the screen. Enough such lines when displayed together make a picture. When memory is an issue a vector representation of a picture will generally save space. Location direction and length will define a line. In the picture below only information for five lines is needed. The arrows are only showing movement and are not displayed. Saving this picture in vector form will save a lot of memory over a raster equivalent. The DEC 340 interestingly is neither a vector device nor a raster scan device though it is very much like a vector monitor. The DEC 340 points to a spot on the screen. The electron gun is fired for half a microsecond or half a millionth of a second after the magnetic yoke field stops changing when a point on the screen is pointed at. The magnet field currents are then set to point to a new place and another dot on the screen is lit up for half a microsecond. Enough such dots displayed together make a picture. Different modes can be set in the DEC 340 to make writing to the screen easier. Two different ‘vector’ modes allow a vector to be specified which is then rendered automatically by the 340 as a series of inter- connected dots to make a line. The distinction is that in the DEC 340 only dots are created to make a picture. Yoke currents never change when a spot is being lit up. A DEC 340 ‘dot’ program with more complexity than an equivalent raster picture is not hard to imagine since a raster scan never crosses itself in a scan. Circuits in the DEC 340 however get pushed to their limit because the path between dots can easily cross over and over again. The dots can be selected in any order so different paths of different complexity could render the same picture. This time I’ve presented a basic description of how the DEC 340 works. It is quite a bit different than computer monitors which came later but its design was the best that could be done at that time for any reasonable cost. It was a good design for the technology of the day. Next time I’ll be getting into some details of the design enhancements made to increase the speed at which DEC 340 ‘dots’ can be drawn. Remembering that the more dots we can draw in a given time the more complex a 340 display image can be. I’ll be comparing the DEC 340 monitor with an earlier DEC monitor, the DEC 30E.